This is the most exciting thing that has ever happened to me! okay, so that MIGHT be a slight exaggeration. but it ain’t far from the truth. you guys, I feel like I’m in a real-life Agatha Christie novel! this is pretty darn awesome. I guess I should explain. the rad sweater, of course, not myself. haha. how cool is that sweatshirt?! I love it. muchas gracias to my dear friend Maye for introducing me to it! after she posted this on Facebook, I perused the original site and ended up pinning it. about ten people I don’t know then liked and re-pinned it. I felt pretty cool. a few weeks later, I get an email from the company that manufactures these babies (Cat vs Human and the Spreadshirt Team). it was a confirmation email, thanking me for my order and informing me that they would make my shirt and ship it shortly. I WAS NO WHERE NEAR A COMPUTER WHEN THE ORDER WAS PLACED AND MOST DEFINITELY DID NOT ORDER THIS MYSELF. so I sent a quick email to my hubs, at work, thanking him for the surprise. His response? that was when things started to get crazy. the order was addressed to be shipped to a temporary address that I hadn’t given out to many people. this temporary address was also listed as the billing address. the order used my married name and new email address, which are fairly recent developments. AND, the order was for an item that I had discussed on two forms of social media, so the anonymous party followed my online networking at least somewhat. it HAD to be someone I knew fairly well, I thought. I texted/emailed/called all of my family and good friends. none of them fessed up. so…I emailed the company to be sure my credit card wasn’t the one actually paying for the order [my billing address had been listed, so I wanted to be sure]. okay. so I am not financially responsible. cool beans. my big question now was not so much WHO had sent me an anonymous gift, as WHY they were sending it. it’s nowhere near my birthday, it’s kind of a weird thing to give for a late wedding gift, I haven’t done any favors that necessitate a return lately…I was puzzled. so, it was an Unbirthday gift. how delightful! I have 364 of those a year, and it was fabulous to finally celebrate one of them! 01 – “Merry”. obviously this salutation in addition to the punctuation at the end of the enclosure is wishing me well. the packaging also did not appear to be tampered with, it looked as if it had come straight from the distributor. I will proceed as if I am meant no harm and there is no hidden anthrax/bombs/anything else harmful contained in this package. 02 – “Unbirthday”. I sent a card to a dear friend recently-ish, wishing her a Merry Unbirthday. this same friend had denied any knowledge of these suspicious activities [and continues to do so], so I will take her word for it. I will therefore simply assume that the sender is rad and loves Alice in Wonderland. this is a good thing. 03 – “Rachel”. they know my first name. that is good. they also did not use any of the nicknames popular among my close friends, so it either was not sent by one [or more] of them or they are covering their tracks. very sneaky. 04 – “Ann”. they also know my middle name, but not well enough to have spelled it correctly. this is very understandable, I myself was mistaken about how my middle name was spelled until I was twelve years old. I could never for the life of me remember if there was or was not an “e” at the end (there is). I never use my middle name in public places, so it is quite possible that a friend who has heard the name, never would have seen it and would have been left to guess at the spelling. so….where does this dissection leave me? all I’m left with is a sweater that I LOVE to wear and a WHOLE HEAPING LOT of gratitude for whoever the mysterious giver is! so, mysterious giver, I’ve inferred that you follow my online presence and I am assuming that you will read this. which is why I have decided to recount the story in its’ entirety and say a big, fat, “THANKS A MILLION!” not only for the wonderful gift, but for the marvelous adventure you’ve sent my way. I’ve enjoyed it SO MUCH. you are the best and I love you forever. I’m sure the answer to this riddle will turn up eventually, somewhere down the road. but until then, I’m quite content to have the thrill of an unsolved mystery in my life! so…I have a lot of things I’d like to say. I have a lot of things I’d love to write about. the only problem is, I don’t have much time. 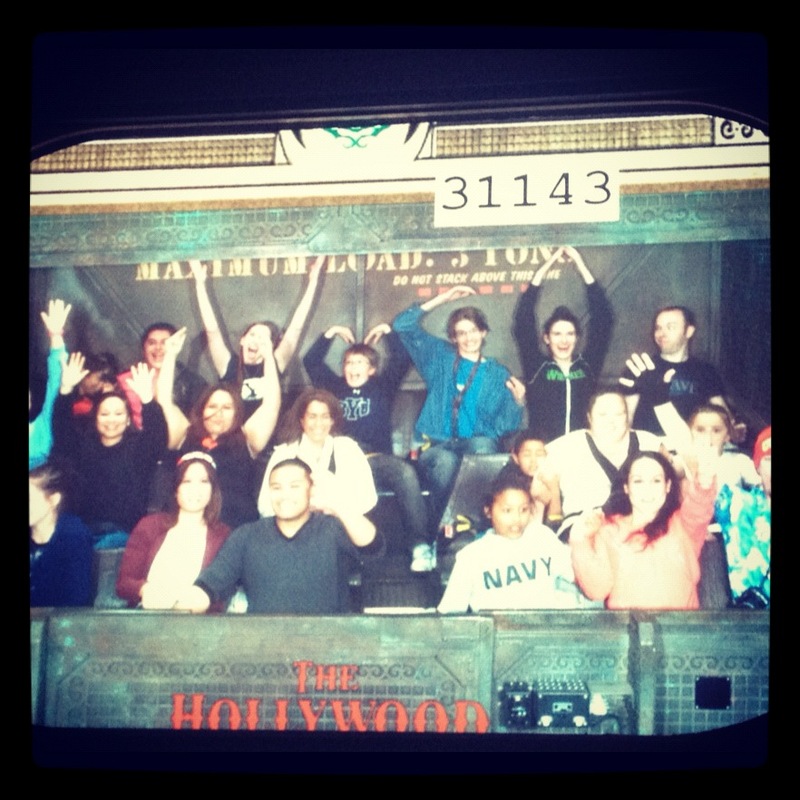 I think I have a love/hate relationship with Disneyland. I know, I KNOW, it’s the happiest place on Earth! how could I even THINK of having hateful feelings toward the epitome of childhood and smiles and all things good?!? I do love that place. I love it a lot. the rides are great, the people are nice, the shows are awesome, the souvenir shopping is fun, the food is yummy, the background music is lovely and catchy, and you get to meet real live princesses and other awesome cartoon characters that have been brought to life!! I guess the only part I don’t really like is the “Disney hangover” that comes from walking around a theme park for fifteen hours in the heat and consuming copious amounts of MSG. and also the times when I forget to bring a sweater because it was 70 degrees that morning and suddenly it is night time and 50 degrees and I am freezing my booty off. our family vacation was truly wonderful 🙂 I’m so happy I got to hang out with my awesome family! 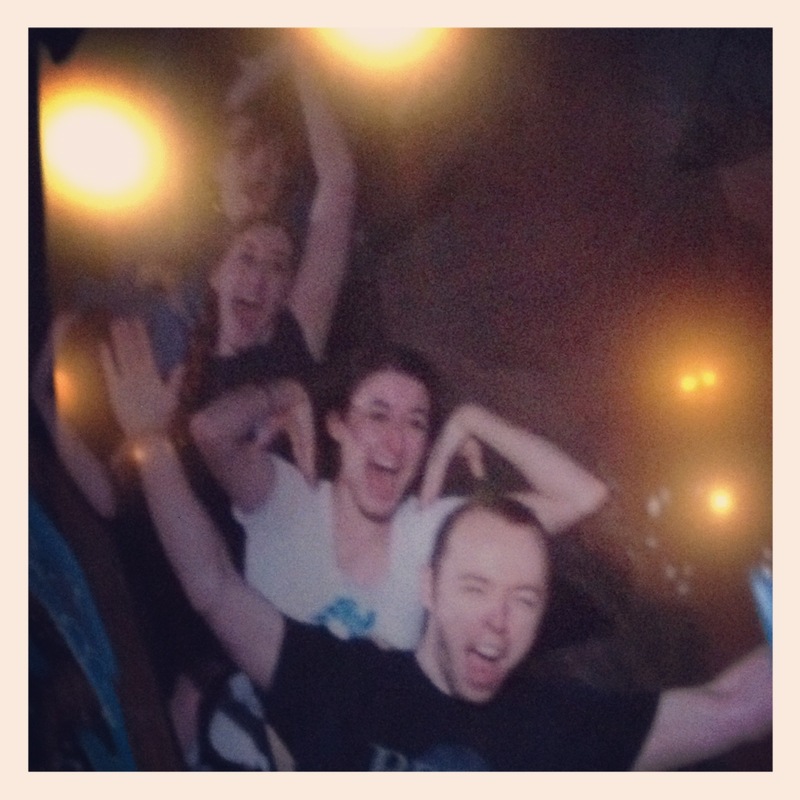 just chillin, ridin coasters, doing the YMCA….nbd. this is a conundrum I have discussed many times before. I blogged about it here and here. [that’s how much of an issue it is, it’s warranted TWO whole blog posts!] and if you are a good friend of mine, it is likely that you are sick of hearing about it by now, therefore you are excused from reading any further. kbye, besties! I like to call this phenomenon, the “if there is any woman that has ever had brown hair and brown eyes, I am apparently identical to them” syndrome. my husband has never previously expressed any symptoms of this queer phenomenon. however, as we were sitting down to dinner last week, he stared at me for a little longer than usual. I laughed. I reminded him that I’ve heard that one before. 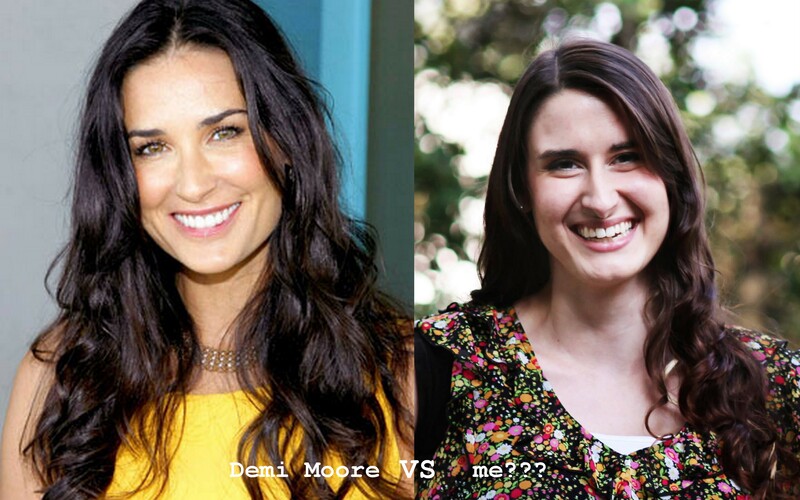 and then I listed off some of the other celeb comparisons I’ve had. AND HE AGREED WITH MOST OF THEM. 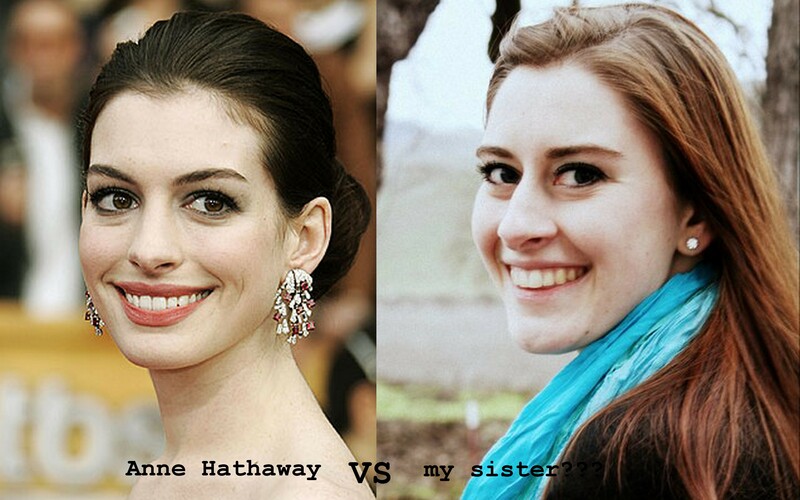 I don’t know why this bothers me [and my sister] so much, having countless dopplegangers. possibly because it feels like you’re stripped of your individuality when you’re compared to others? that your beauty only counts because you look similar to someone the media/general public has deemed as beautiful?? or simply because WE LOOK NOTHING LIKE THESE PEOPLE??!!?!?!?!!? I don’t know. I don’t spend too much time analyzing these things, because they don’t actually matter. it’s just a pet peeve, and a rather ridiculous one at that. awesome baby stories blogging compliments doppleganger family funny story hair hilarious husband Ice Cream ice cream review long hair love mint chocolate chip silly soapbox spectacles TQFTMDMCCIC young blogger.